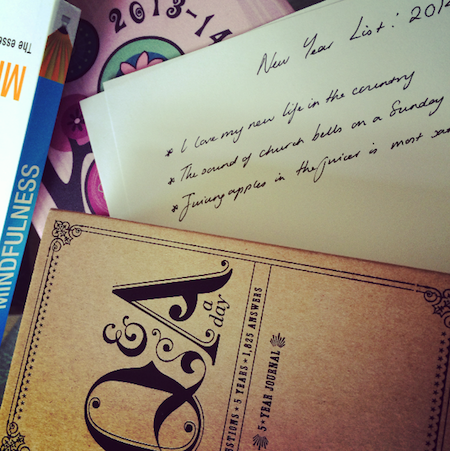 At the start of every New Year I take a piece of paper and I write down all the things that I am thankful for. Yes, I know, pass the sick bucket and all that, but if I can be serious for a second: in this fast-paced, competitive world we now inhabit, it is incredibly important to take a moment to appreciate what we have. To appreciate what we are. Because we are all unique – there is nobody else exactly like us – and therefore it is futile, in many ways, to spend hours and hours comparing ourselves to other people. A little competition is healthy, but it’s easy to tear ourselves apart and feel inferior; so-and-so is thinner, richer, happier. Miss X seems to have it all but is a horrible person. Jenny P from the next street over has the perfect home and family, Sarah Thingummyjig has thousands of Twitter followers and only tweets utter crap. There is only one thing that can come from such musings, and it’s a feeling of bitterness and negativity. Either you feel that people are better than you and this makes you a failure, or you feel that others are undeserving of their successes and this, ultimately, will make you into a bitter old bean. So: this year, let’s focus on who we are and what we are good at. At the top of your piece of paper, make sure you write “2013”, because you are going to be writing a lot of these New Year lists over the course of your healthy and wonderfully happy life. (How fortunate to have your health – pop that one at the top of your list.) Now really sit quietly and think of all of the things that make you you. It can be something as silly as the fact that you always wear odd socks or as profound as the fact that you quietly do lots for charity, or care for an elderly or sick family member. Which things about your personality shape you and make you unique? Now think of all of the things that you are grateful for – it might be your job that enters your mind first, and that’s fine; it might be your partner or your Mum. Only you will read this list, ever, so be honest and don’t feel any embarrassment. Lastly, if you want to add any “resolutions” to the list then be my guest – it’s always good to have a reminder to stop eating so many sweets or to swear less – but really, the most helpful thoughts will come as a result of writing your list. By thinking about your life and what you’re grateful for, you’ll also find that there will be some points that you’ll feel unhappy about and you’ll naturally think those over and mark them in your head as areas you might want to change. For me, last year, I didn’t feel so great when I wrote that I was grateful for “my home” and I knew that it was time to start making changes about where I lived. I also didn’t feel happy about having “time off” (which I’d always written down as a perk of being a freelancer) which made me think that perhaps I wasn’t really getting enough quality downtime. I’ve been working on that aspect of my life, too. This post wasn’t supposed to be more than a brief “Happy New Year” to you all, but I do find my NY List very helpful and I love looking back on previous ones (“Give up Fanta”? I can’t ever remember drinking Fanta!). I have my pages loose, in my “important stuff” drawer, but you could equally type into your computer and passcode-lock the file, if you feel particularly nervy about having personal feelings written down. Whatever suits. If you really can’t bear to put pen to paper, so to speak, then take a while to sit quietly and think things through instead. It isn’t quite so cathartic, in my opinion, but again, whatever floats your boat. A Happy New Year to all of you and may 2014 bring great success and happiness. Previous Post Shopping the Sales: What I’ve Bought. So Far. Next Post Future Words: Your Advice, Please!